In today’s passage, Jesus tells His disciples that He came to earth in order to offer His life as a “ransom for many” (Mark 10:45). This concept of ransom is extremely important for rightly viewing the work of the Savior and is related to several other concepts, all of which we will consider in turn. In the ancient world, a ransom was paid in order to secure the release of a captive. A price could be paid to buy a slave’s freedom or to release a hostage, for example. Today the term is most commonly associated with kidnapping, where money or some other service is demanded in exchange for the safe return of a victim. Importantly, the kidnapper determines the price that sets the hostage free. Some in church history have said the devil is the person to whom Christ pays the ransom. But if this were the case, the devil would be the one who wins the victory. After all, the person who receives the ransom payment is the one whose goals have been met. Scripture routinely presents Satan as the foe whom Jesus defeated (1 John 3:8b), and so clearly the evil one cannot demand any ransom. God alone determined the ransom amount, and so Jesus bought us out of the wrath rightly due our sin. Consider how some of us might exchange “green stamps” or tokens for some good or service. In a similar manner, Jesus gave His life in exchange for our safety from divine judgment. By faith we are saved — but not from Satan. We are saved from the wrath of God (1 Thess. 1:9–10). Propitiation and expiation are the two final theological terms that we will examine today. Expiation conveys the idea of cleansing sinners of their sin or of removing the penalty of our sins. It is readily associated with the Old Testament sacrificial system and also with the work of the one who “takes away the sin of the world” (John 1:29). Yet Christ’s death on the cross involves more than covering our sins, it also placates the wrath of God. This is what propitiation means. The Lord’s holiness demands punishment for sin, and in Jesus, God satisfies His own wrath (Rom. 3:21–26). He is therefore propitious, that is, favorable to His children. Dr. R.C. 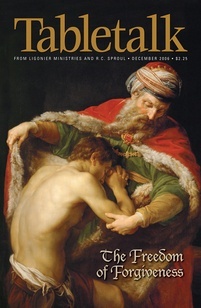 Sproul reminds us that the Bible teaches “both Father and Son willed the salvation of the elect and worked together to bring it to pass” (Essential Truths of the Christian Faith, p. 174). On the cross, Christ did not persuade the Father to do something He did not want to do. His coming into the world to save the elect was a result of the love of our triune God. Take time to meditate on this love and illustrate it by doing a favor for someone today.